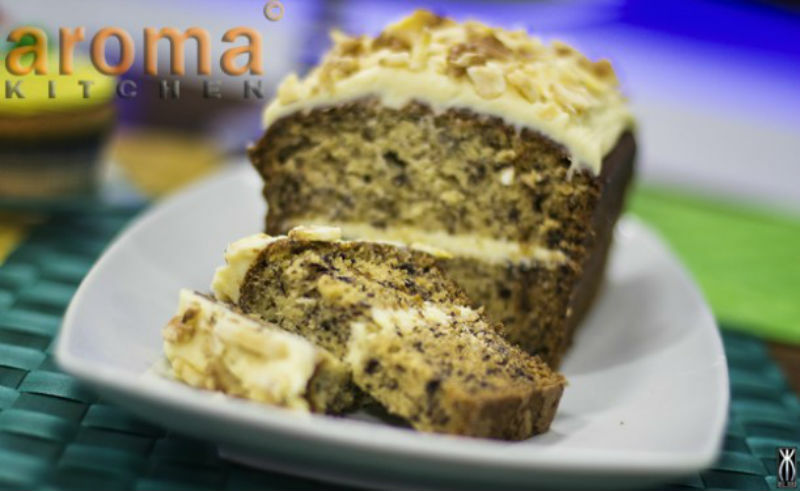 This banana bread with white chocolate topping is surely a must do! 1. Start this recipe by preparing the ganache. 2. Place the white chocolate, fresh cream and rum together in a small saucepan and heat together gently till the chocolate has dissolved and you have a thick creamy chocolate sauce. 3. Put aside to cool while you preheat the oven to 180oC and grease and line a 20cm x 12.5cm loaf tin. 4. Sift the flour, bicarbonate of soda and salt into a large mixing bowl and put aside. 5. In a separate bowl, cream the margerine and sugar together until light and fluffy. 6. Add the eggs, mashed bananas, natural yogurt and vanilla extract to the butter and sugar mixture and mix well. 7. Fold in the flour mixture. 8. Pour the cake mixture into the prepared tin and bake in the oven for about an hour, or until well-risen and golden-brown. 9. Remove from the oven and cool in the tin for a few minutes, then turn out onto a wire rack to cool completely. 10. Remove the banana cake from the tin and transfer onto a serving plate. Pour over the cooled and thickened white chocolate and rum ganache and decorate with walnut halves. 11. Allow to set before serving.